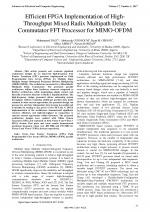  A Computationally Efficient Pipelined Architecture for 1D/2D Lifting Based Forward and Inverse Discrete Wavelet Transform for CDF 5/3 Filter, CEKLI, S., Advances in Electrical and Computer Engineering, ISSN 1582-7445, Issue 2, Volume 18, 2018. 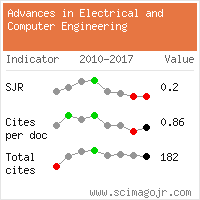 An Automatic Instruction-Level Parallelization of Machine Code, MARINKOVIC, V., POPOVIC, M., DJUKIC, M., Advances in Electrical and Computer Engineering, ISSN 1582-7445, Issue 1, Volume 18, 2018. Website conception, design and maintenance by Eugen COCA. Content updated on 28 Feb 2019. Site engine updated on 28 Feb 2019. This page was generated on the server in 0.050 seconds and loaded in your browser in > seconds.